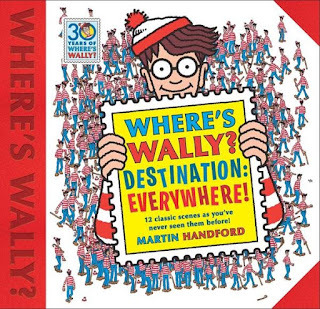 Kids' Book Review: Review: Where's Wally? Destination: Everywhere! Review: Where's Wally? Destination: Everywhere! Most people have a strong feeling about this character. If you love him you get excited by each new adventure or maybe he frustrates and challenges you to give his books a go. Who am I referring to? Wally, from the Where's Wally Series. 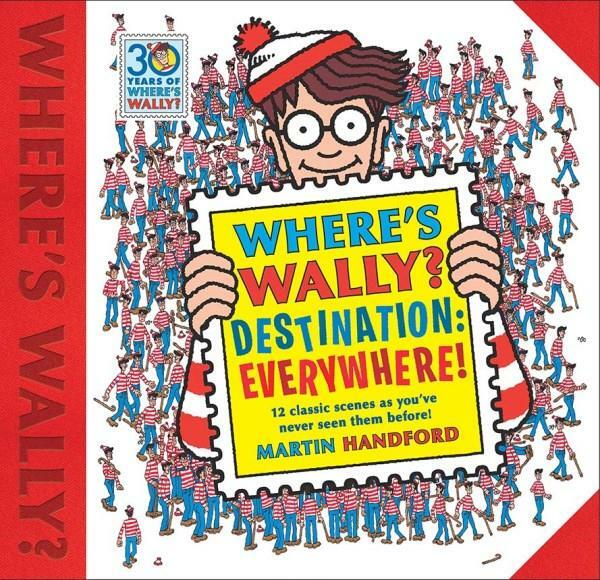 Children and adults have been searching for Wally for 30 years. Where's Wally? Destination: Everywhere will delight fans. Martin Handford has selected 12 favourite Where's Wally scenes for this new book, including dinosaurs, pirates and dragons. Even if you have read Where's Wally? books before you will still experience new discovers within the pages of Where's Wally? Destination: Everywhere. There are many hours ahead pouring over the very detailed pages trying to find Wally, Woof, Wenda, Wizard Whitebeard, Odlaw and the Wally watchers. There are additional objects to find that the gang has left behind somewhere on each page. Plus a checklist for each scene listing things to discover, adding hours more fun reading this book. It is unbelievable how much there is to see and find. However, this is not a simple finding book, it will stretch the brain. Readers can sharpen their attention to detail. It challenges readers to spot the difference. There are activities to unscramble letters, solve mazes, search for colours and shapes, sequence patterns, count and find. Where's Wally? Destination: Everywhere can entertain even the most active child for hours. I love how this is a book you can keep coming back to, that readers become so absorbed in the illustrations that they loose track of time. It is enjoyment with a challenge or pinch of frustration. Earlier in the year the book Where's Wally? The 30th Anniversary Edition was released. I implore Wally watchers to grab a copy of Where's Wally? Destination: Everywhere for yourself or someone you love and enjoy the journey that it takes you on, through history and your imagination. Title: Where's Wally? Destination: Everywhere!